The CD79a molecule (MB-1, Igα) is part of the MB-1/B29 (CD79a/CD79b) disulfide-linked heterodimer which is non-covalently associated with membrane immunoglobulins (Igs) to build the B Cell antigen Receptor (BCR) complex. CD79a is a 40-45 kDa glycoprotein and belongs to the Ig superfamily of surface antigens. 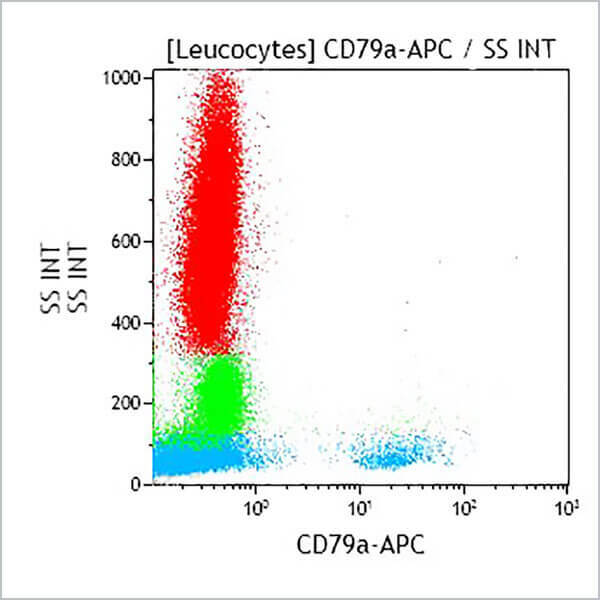 CD79a protein is specifically and strictly expressed throughout B lymphocyte differentiation. It appears early in ontogeny, probably before expression of cytoplasmic μ-chain, and is present in the cytoplasm of plasma cells. Clone Description The HM47 antibody is recommended to be used in flow cytometry after permeabilization with saponin-based permeabilization reagent IntraPrep. The HM47 antibody reacts with a cytoplasmic epitope of the CD79a molecule.